For a very long time since I decided upon UX as the theme for this blog (apart from things happening in my life), I vied for some original content. I tried to put some reviews and my interpretations. I also borrowed heavily from existing blog posts. I wanted to start a series of posts where I discuss some of the existing products and put open questions to you all on how to improve these products. Once I have some clarity on what product design I want to work on, I will take up one at a time and start executing the concept.Towards that end this is my first post, where I will discuss some of the short comings of the present day white board marker. All of us are familiar with a white board marker. How many of you had issues using it? You might say what issues in using a white board marker? Let me list it down for you and I request you to observe the next time you come across one. i) I would never know if the marker has ink in it or not. ii) The writing tip is invariably flattened after a few uses. iii) It is difficult to find out why the marker is not functional. The ink is over or the writing tip is bad. iv) The cap that is used to cover the tip does not fit properly at the back. Most of the times it falls down. v) The shape of the marker is round. It rolls on most surfaces. vi) Almost all the markers I used have a plastic cover around it. It peels of and distracts/interferes with the free flow of writing. Now, I don't see any reason why the design cannot be improved. What do you think? What are your suggestions. Add a small cuboid type edge pop out as far as away from writing tip possible. It will impede easy gripping provided by cylindrical construction and yet will stop rolling after certain extent. You could actually design in such a way that if marker rolls it will always stop with label being displayed :). I meant it will not impede. Lag between mental thoughts and typing sorry :). I have some more designs in mind and will post them in the following days. Will choose one of them depending on the time i can spend to build a prototype. let's see if I get to building a prototype(with all the other stuff in my life), will for sure see to it that you folks get to use it. Wow a valid problem indeed and i'm waiting for your solution prototyped. Hmm, most of the markers I have used already solve all of your listed problems. Perhaps the companies who make the cheaper ones don't really think about these, but Issue 1 is the only "problem" I have seen in 90% of the markers I have used (actually I'd say 100% but I really can't be that sure ;)). Issue 1 was never a huge problem, because it so happens typically the first one who discovers its out of ink just throws it in the dustbin. This is more of a case where following a process will remove a lot of pain ;). 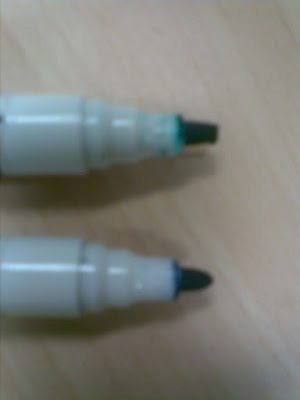 Many of the markers have an "anti roll" design with a thin line (typically on the cap). Perhaps the reason why they put it on the cap instead of the pen, is to remind you to put the cap back on always since the tip drying *is* an issue. I'd say almost all of the issues you very valid but theyt only apply "low end" markers. I can say a brilliant idea, taking this as an example. But did it sounds like, finding out problems that the existing solutions/designs have ? What I found is, it’s always work two ways. If you identify some great designs then later on discovering some silly-billy problems in it, and then again an effort to make the design better. The point here is to emphasis the potential lying inside the concept of re-designing, which in turn a sign of ‘a change’ or probably discovering completely ‘a new’. do you know some one who can help me in getting hands on?? point 1 is an issue. In a meeting when a serious discussion is going on and when you pick the marker to prove write something and it does not write!! man that breaks the thought flow and also the spell i have on the audience. My question is why low end markers cannot be better? why can't a company come with a better design at same cost? what is stopping them? i also believe that any design that we can use is a good design. a good design with aesthetics is a great design (iPod). But when one starts from scratch there is no great design, the max that we can have is a good design. which has to undergo a lot of iterations to become great. take any major product, the first rev. tough might be a great hit is not the best. It is only with time that designs will grow. (not all designs get this luxury). What makes an ipod an ipod? Is it cheap? ... When people are buying the stuff without caring that the pen is of good quality, the company will continue making crappy pens, no need to hire a pen designer :) Econ 101.